Glad I'm not the only one who thought this. The ketogenic diet is meant for children with severe epilepsy. When I worked in the hospital (peds neuro), these kids needed to be admitted to initiate the diet and remain hospitalized for 3-5 days of close monitoring. I once had a child who became so severely acidotic (bicarb of 9) that she needed multiple IV sodium bicarb infusions throughout my shift. It's crazy to me that this has become a fad diet. I don't see the relevance to the length of the husband's employment, the prestige of his job or the affair either. I'm sure plenty a nurse (and MD) has had an extra-marital affair in his/her day. OP, if your best friend was fired for trafficking heroin and/or meth into a prison, presumably her employer would have reported her to the BON when she was fired. I went on a date with someone from Match once and he asked me what kind of patients I see. At the time I was a visiting nurse in pediatrics. I specifically remember the look of horror on his face as I told him about one of my infant patients who had hypoxic ischemic encephalopathy because of severe shoulder dystocia during delivery. I met my significant other through a meetup group. We played trivia together as friends every Monday for a little over a year before we started dating. I was working a M-F job at the time though so could attend these things. Every single woman has experienced this at some point in her life. Your manager hasn't given a second thought to it since it happened, guaranteed. Who would insert such a line to be used for the purposes of execution? The AMA and the ANA both have policies against physicians and nurses participating in executions. I'd call placing the line that will be used to administer lethal doses of medications to the condemned prisoner "participation." 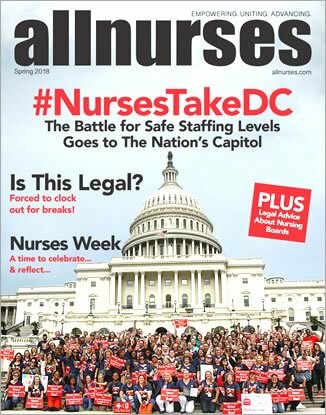 NEW VOICES: American Medical Association, EMT Association Say Participation in Executions Violates Medical Ethics | Death Penalty Information Center ANA Releases New Position Statement Opposing Capital Punishment (2/21/17) Highly recommend the books Dead Man Walking and The Death of Innocents by Sister Helen Prejean if anyone is interested in the topic. I think you're my new best friend. Stop visiting the mother-in-law's sister? That's what I'd do. No one is talking about the church. Churches do not have to follow the law, they are free to marry or not marry anyone whom they please. The Catholic Church in MA has performed exactly ZERO gay marriages in the 11 years since it became legal in Massachusetts. The state cannot force a Catholic church to marry a gay couple in any of the states where it is legal nor can they stop an Episcopalian church in, say, Alabama from performing a religious marriage ceremony for 2 men or 2 women. Marriage is also a state institution, hence why you need a license granted by the state to marry. In all the weddings I've been to in the past 5 years, exactly one of them has been in a church. Marriage is clearly not exclusively a religious issue. I was also horrified by that statement. And I fail to see the "problem" or the relation to nursing. OP, did you never listen to Sir Mix-A-Lot circa 1992? Big butts are not a new thing by any stretch of the imagination. I agree with this. I block the vast majority of men who contact me through OkCupid because most of the messages are along the lines of "heeyyyy sexxxyyy wanna hook up?" And most of them don't have jobs or live with their parents. Not interested. I don't suggest Tinder because that's essentially meant for people who are just looking to hook up. The quality of people on pay sites is superior. Joining meetup was one of the best things I ever did for my social life. I also joined adult sports leagues in my city (I play floor hockey weekly and have played in kickball, softball, flag football, broomball and inner tube water polo leagues) and a local hiking club. Most of my long time friends are married with kids and I'm not, nor do I want to be. I'm single but Sam Adams was my Valentine this year. He's my date tonight too. I believe that Jesus existed- that is a historical fact. There lived a man named Jesus in Judea in the first century who preached and had followers. Nearly all historians agree that he was certainly baptized by John and crucified by Pontius Pilate. Those events are historically accurate. Even most non-Christian religions acknowledge that Jesus lived. I do not believe that he was immaculately conceived or that he was the "Son of God" or that he "died for my sins". I believe that Jesus had a birth father and that he very likely was married and had children. How many 33 yr old bachelors were walking around in the Middle East 2000+ years ago? I also think it's absurd that the pictures I was shown of Jesus growing up portrayed him as a white man when he was Middle Eastern. That's alright. I'm a Mass-hole. I hate everyone and they are free to hate me back. My mother never told me that, a kid I went to school with did. My point by saying that was not that I was misled by my family or the church but that I had doubts about the spiritual realm from a very young age. The Catholic Church is NOT *my* church. I know what it teaches and I reject it, just as I reject all organized religion. I have had no use for religion since I was a teenager but I still had a small belief that there may be some sort of higher spiritual level. After 7 years as a pediatric nurse, I do not.